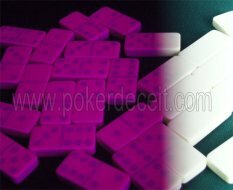 Dominoes (or dominos) generally refers to the collective gaming pieces making up a domino set (sometimes called a deck or pack) or to the subcategory of tile games played with domino pieces. In the area of mathematical tilings and polyominoes, the word domino often refers to any rectangle formed from joining two congruent squares edge to edge. The traditional Sino-European domino set consists of 28 dominoes, colloquially nicknamed bones, cards, tiles, tickets, stones, or spinners. Each domino is a rectangular tile with a line dividing its face into two square ends. Each end is marked with a number of spots (also called pips) or is blank. The backs of the dominoes in a set are indistinguishable, either blank or having some common design. A domino set is a generic gaming device, similar to playing cards or dice, in that a variety of games can be played with a set. Mahjong (also called mah-jongg by the American association) is a game for four players that originated in China. It was called Mahjong (meaning sparrow) in ancient China. However, most Chinese now call the game Mahjong. 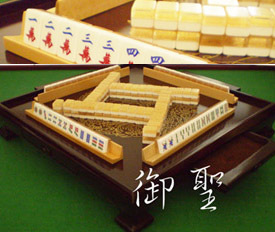 Mahjong involves skill, strategy, and calculation, as well as a certain degree of luck (depending on the variation played, luck can be anything from a minor to a dominant factor in winning). In Asia, mahjong is also popularly played as a gambling game. In the game, each player is dealt either thirteen or sixteen tiles in a hand, depending on the variation being played. On their turn, players draw a tile and discard one, with the goal of making four or five melds (also depending on the variation) and one pair, or "head". Winning comes "on the draw" by drawing a new or discarded tile that completes the hand. Thus, a winning hand actually contains fourteen (or seventeen) tiles.